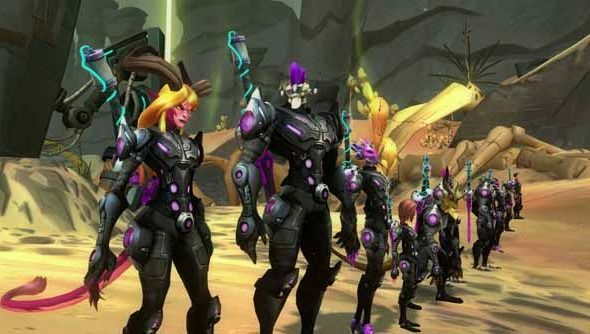 Jeremy Gaffney has been Carbine’s president, executive producer and latterly the public spokesface for what might be the last great subscription MMO: Wildstar. But now he’s taking a back seat and allowing Carbine’s “current development stars” to lead their launched game into an update-heavy future. Gaffney will adopt a consulting role within Carbine – and is eyeing similar roles elsewhere in the games industry. In the last year, Gaffney has lost several members of his family to cancer – and been treated for a potentially fatal form of skin cancer himself. He had left the illness go undiagnosed for nine months while working on Wildstar. Surgery was successful, and Gaffney is now cancer-free – but the episode was a “hell of a wake-up call”. The decision to pass the Wildstar controls over to others at Carbine followed soon afterwards. “On the professional front, when you lead a team this size in a company this size, there are a variety of strong opinions on every major decision,” said Gaffney. “It’s been a pleasure helping steer us through to launch, but I think having one less strong opinion in the mix can be a good thing too. Even if I’m always right, of course. Gaffney began his career in the early days of MMOs – as a co-founder of Turbine with a hand in Asheron’s Call. We’ll certainly miss crossing paths with him as Carbine’s public voice. His belief in Wildstar and the future of subscription MMOs, as well as his tendency to swear about gold farmers,made for great interviews.